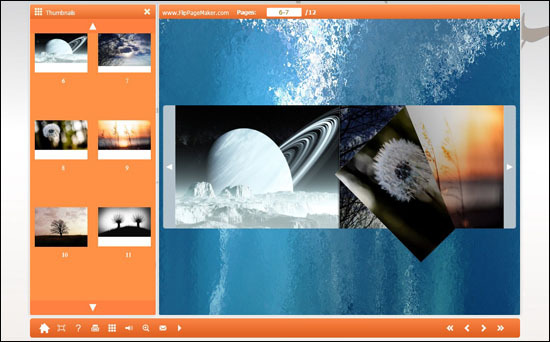 Free FlipPhoto Maker creates flash flipping photo books, photo albums using your digital images. We suggest you to save your photos in JPG format and then collect them into a flipbook. Free FlipPhoto Make is not only available to JPG images, but also images in PNG, GIF and BMP formats can be import freely. There is no convert limit, no time limit, and no fee requirement. 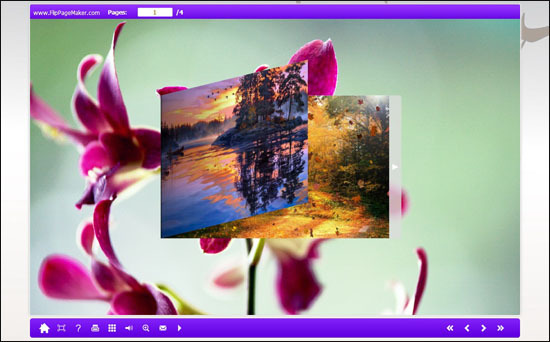 This free digital album maker is creative and ease-of-use program. Within 10 minutes you can create a flipping photo album that can be widely shared online. However, if you want to publish page-turning e-book from PDF file, you may be interested in FlipBook Creator Professional. To know more detail information about Free FlipPhoto Maker, please go ahead to learn more about it. - Convert to EXE flipping book to view it on local computer directly. - Create table of the flipping book in Bookmark panel. The most important feature of a flip digital album is that it shows like a real book on hands. Pages can be flipped easily with dragging or clicking your mouse. This real page flipping effect gives people a fresh feeling. This amazing display of photos really brings nice user experience! To publisher your created flip photo onto your website, you should choose html as output type. Then view the html flip photo by opening the html file in the output folder. To make your photo outstanding and attract more eyes, please simply change the background image and import a piece of beautiful music into background. In last step, you can successfully share your photos with others via Internet.